The Nizam's Entourage - An Exhibition Of Photographs By C K Polacek is an event that took place between 08-Feb-2006 and 27-Feb-2006 in Hyderabad. If you are one of those who never cease to be fascinated by the royalty that seeded the unique city of Hyderabad, here is another collection that will capture your imagination. A long hidden photograph album belonging to a certain C K Polacek and containing pictures of the entourage of the Nizams, is on display for public viewing at the Salarjung Museum. These are 19th century works currently in the possession of Mrs. Chaya Devi and Mr. B. Narsing Rao who are organising this viewing. It will be curated by Dr.Marie-Eve Celio alongside the exhibition of the Nizams' jewelry. For further details, please contact Alliance Francaise at 2770-0734/35/36. 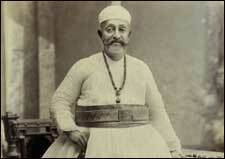 Be the first to comment on The Nizam's Entourage - An Exhibition Of Photographs By C K Polacek! Just use the simple form below. fullhyd.com has 700,000+ monthly visits. Tell Hyderabad what you feel about The Nizam's Entourage - An Exhibition Of Photographs By C K Polacek!